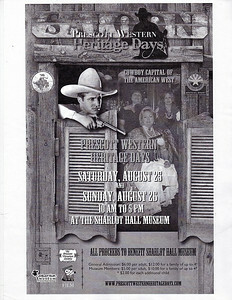 August 25th and 26th, 2012 Prescott Western Heritage Days at The Sharlot Hall. 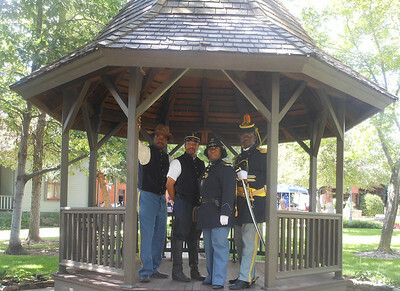 The Official Arizona Centennial Legacy Project "Buffalo Soldiers of the Arizona Territory - Ladies and Gentlemen of the Regiment," Headquarters Mesa, Arizona is an "INDEPENDENT ORGANIZATION". Prescott Western Heritage Days at the Sharlot Hall Museum. It was founded in 1928 by Sharlot M. Hall, poet, historian, and independent thinker, whose passion to preserve the Territorial Governo's Mansion let to the development of the modern Museum campus you find here today. Special Invite from The Prescott Regulators & Their Shady Ladies, Inc. 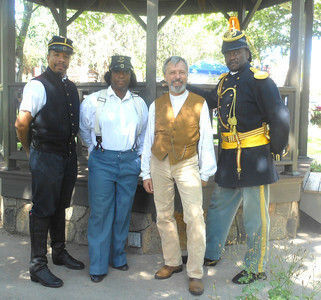 It is my pleasure to invite the members of the Buffalo Soldiers of the Arizona Territory - Ladies and Gentlemen of the Regiment, one of the nations premier historical re-enactment groups, to participate in the third Prescott Western Heritage Days on August 25th and 26th, 2012. This event will bring together one of the largest groups of historical re-enactors in Prescott Arizona for a celebration of the history of this Great State. We would be honored to have your troop bivouac at The Sharlot Hall Museum. Sharing your Bivouac area will be members of the Ft. Whipple Regulars (The Military Arm of the Prescott Regulators & Their Shady Ladies, Inc. and the Rough Riders). We are honored to have your group participate in this event. There will also be a costume contest on Saturday afternoon and your officiers, enlisted men and the Ladies and Gentlemen of the Regiment are invited to participate. 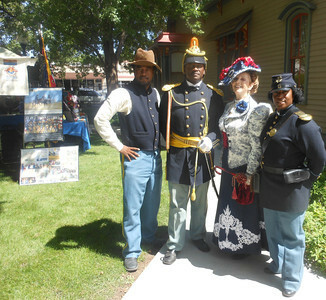 This event is presenting Arizona as it was from 1866 to 1912, our costume contest represents the same period. 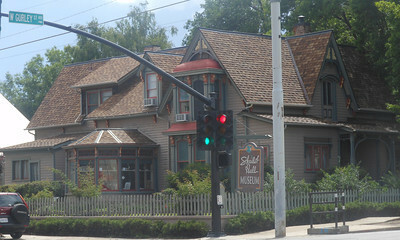 This is a combined effort of Sharlot Hall Museum, The Prescott Regulators & Their Shady Ladies, Inc., The Prescott Victorian Society, Inc. The Elks Opera House Guild, The Prescott Buscaderos, The Rough Riders and NOW, your Esteemed Organization. I would like to Thank You in advance for your participation and would be honored to accept your phone calls with any questions. Neil W. Thomas, President - Prescott Regulators & Their Shady Ladies, Inc. 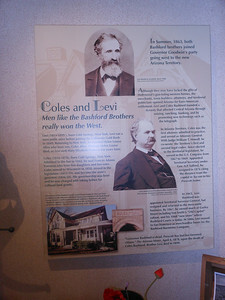 THE PRESCOTT VICTORIAN SOCIETY. 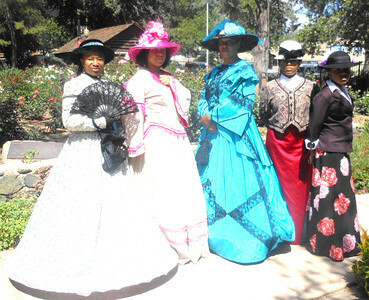 The Prescott Victorian Society is dedicated to providing activities and programs aiding in the knowledge and understanding of the Victorian and Edwardian eras. 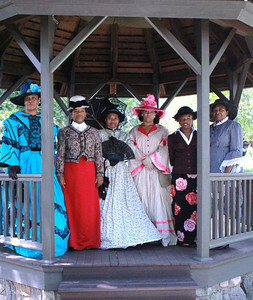 Understanding women's fashions of the time period can be a first step in understanding the Victorian woman. Sharlot Mabridth Hall was an unusual woman for here time: a largely self-educated but highly leterate child of the frontier. Born in 1870, she traveled with her family from Kansas to the Arizona Territory in 1882. 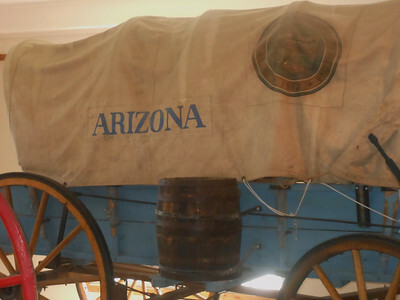 She loved ideas and the writeen arts and expressed her fascination with Arizona frontier life through prose and poetry. 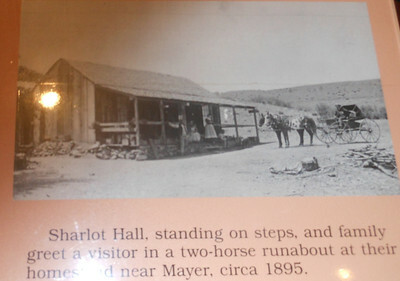 In 1909, Sharlot was appointed Territorial Historian and traveled the rugged backcountry. 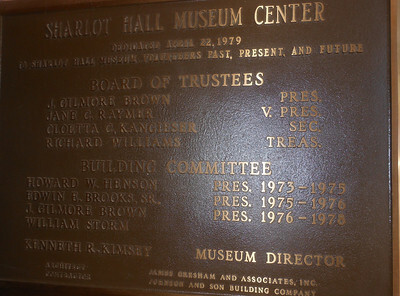 After her death in 1943 a historical society continued her efforts to build the Museum that now bears her name. In 1981, Miss Hall became one of the first women elected to the Arizona Women's Hall of Fame.